“Senator, I realize my testimony wasn’t the most cheerful thing you’ll hear today.”—Federal Reserve Chairman Ben Bernanke to Senator Richard C. Shelby during Bernanke’s testimony to Congress on February 27, 2008. Following strong growth during the third quarter of 2007, the U.S. economy stagnated at the end of the year. Though an official declaration is several months away, many economists believe that the economy may have slipped into recession during the first quarter of 2008. A main economic headline in 2007 was the housing downturn, which triggered a global financial crisis and record high oil prices. These trends—which have persisted into 2008—suggest an economy balanced on the edge of a knife blade. On one side is stagnant growth or even recession. On the other side: inflation. As world economic growth accelerated during the past several years, especially in China and India, demand for oil and other commodities has risen. In addition, oil is priced in increasingly devalued U.S. dollars, pushing the cost even higher for U.S. consumers. During the first quarter of 2008, it became clear that inflation has returned to the U.S. economy, with headline inflation rising at the highest level since Hurricane Katrina derailed oil production and sent prices soaring for several months. More troubling is the high rate of core inflation (excluding the volatile food and energy components), suggesting broad-based inflationary pressures in the economy. This is one time when these goals conflict with each other. To promote economic growth, the Fed has lowered interest rates and indicated a willingness to go further should growth deteriorate. Relaxing monetary policy, however, has the side effect of increasing inflation. The last time the economy faced this set of circumstances was during the stagflation years of the 1970s, which were marked with high inflation combined with weak economic growth. 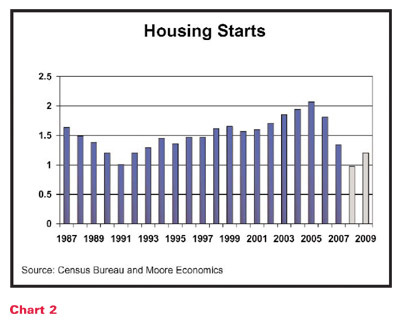 Housing, which pulled the economy down in 2007, will continue to be a drag on the economy through 2008. As the price of most Americans’ largest asset continues to erode, and credit becomes even tighter, consumer spending will weaken. After growing 2.9 percent in 2007, it is predicted that consumer spending will slow to 1.2 percent in 2008 before rebounding to a 2.2-percent rate in 2009. Capital spending is driven by profits, which have grown solidly over the past five years as operating rates have tightened. Operating rates have been falling since the third quarter of 2007, however, and profits are softening. Credit also is tight for businesses. As a result, capital spending will fall back. 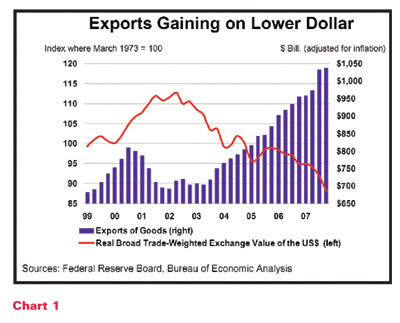 One bright spot, however, is the lower value of the dollar, which serves to make U.S. exports relatively less expensive and imports relatively more expensive. As a result, the U.S. trade deficit improved in 2007 and is expected to improve in 2008. Many economists anticipate that the dollar will remain weak through 2008 before strengthening in 2009. In addition, the economies of many U.S. trading partners—including Canada, Western Europe, Latin America, and Asia—continue to expand, though at somewhat slower rates than in past years. This will keep demand for U.S. exports up. The International Monetary Fund projects global Gross Domestic Product (GDP) to grow by 4.1 percent in 2008. Stronger exports, rather than capital spending, will be the growth driver in 2008. Last year, oil prices returned to levels unfamiliar to the 125 million Americans born after 1980. As China’s economy surges ahead, Chinese consumption of oil has grown at a rate several times faster than those in developed countries. Last year, China alone accounted for nearly half of the incremental increase in global oil demand. Despite the fact that the United States is far more energy efficient than it was during the 1970s, sustained high oil prices are beginning to take their toll. By the middle of the first quarter, gasoline inventories were at a 15-year high, suggesting that $3-per-gallon gasoline is causing consumers to change their driving habits. The Energy Information Administration (EIA) projects that oil prices,1 which moved above the historic $100-per-barrel mark in February, to average close to $90 per barrel for the year, before slipping to around $82 per barrel in 2009. Natural gas prices are expected to average around $7.60 per million British thermal units (MMBtus) in 2008, and $7.75 per MMBtu in 2009, according to the EIA. Ethanol, made primarily from corn, has been heralded by many as the means to get Americans to reduce their dependence on foreign oil supplies. Huge investments in ethanol capacity have been made over the past several years, and many projects are in various stages of development. According to the Renewable Fuels Association, at the end of 2007, U.S. ethanol capacity had reached 8.4 billion gallons per year (bgy). In 2008, capacity is expected to grow by 2.8 bgy, to 11.2 bgy, and will surpass 13 bgy by the end of 2009. At the beginning of 2008, several competing bills to reduce greenhouse gas emissions were under consideration in the U.S. Congress. All of them feature some variation of a “cap-and-trade” mechanism, whereby emissions will be capped and emitting entities will be required to purchase an allowance equal to 1 metric ton of carbon dioxide equivalent. This legislation will have serious implications for energy-intensive industries across all sectors and will provide opportunities for energy-saving materials, devices, and technologies. During 2007, total construction spending was off by 2.5 percent. Spending in the residential sector declined by 17.7 percent, led by the sharpest downturn in housing in recent memory. By the first quarter of 2008, inventories of new and existing homes were bloated, averaging 10 months’ supply at current sales rates. 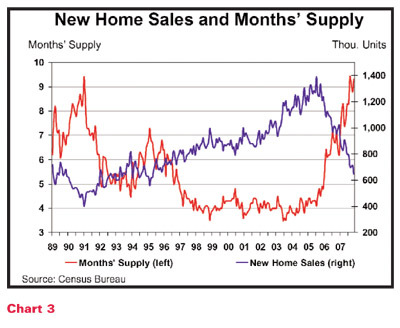 Home prices will remain depressed until these inventories are worked off. Home sales will depend on employment (and thus income) prospects and, of course, the ability to obtain an affordable mortgage in a tight credit market. As the imbalance unwinds during the rest of 2008, housing starts will fall to 980,000—down from a high of nearly 2.1 million in 2005. The downturn in housing, however, has been offset by strong gains in private, nonresidential construction, which rose by 18.2 percent, and public construction, which was up by 12.4 percent in 2007. Last year, among the largest gaining segments in the private, nonresidential sector were lodging, office, commercial, and power. In the public construction sector, health-care, public safety, transportation, and publicly funded power projects were the largest gainers. Looking ahead to 2008 and 2009, spending on private, nonresidential projects will be constrained by soft profit growth and continued weakness in housing as it relates to commercial and retail projects typically located near new housing developments. As consumer spending and personal income growth weaken, so will tax revenues from sales and income taxes. Also, as housing prices continue to sag and foreclosures accelerate, the property tax revenues that support many local government projects will be at risk. Overall construction spending will be off by 3 to 5 percent in 2008 and will slip 1 to 2 percent in 2009 before regaining traction as the housing crisis finishes unwinding and the economy recovers. Chemicals. The $663-billion chemical industry has been affected by weakness in industrial markets, especially those tied to construction and light vehicles. Many key end-use markets for chemicals in the manufacturing sector have been decelerating or declining as the economy deflates. The low value of the dollar and stronger overseas growth have boosted exports, which have partially offset softer domestic demand. The American Chemistry Council projects chemical output to increase by 0.8 percent in 2008 and by 1.8 percent in 2009. Food processing. Even during a recession, a growing U.S. population still needs to eat. The cost of doing so, however, is increasing. As discussed above, production of corn-based ethanol is growing strongly. This surge in demand has raised the price of corn and many products along the supply chain (including beef, poultry, and dairy products). It also has put pressure on the price of other grains that can be substituted for corn and their respective supply chains. In 2007, the price of food increased by 3.9 percent—the strongest gain since 1990. Between higher food and gasoline prices, less disposable income is available for higher value-added food products (such as convenience or gourmet foods) and meals eaten outside the home. Sales of organic food also may be affected by the downturn in consumer spending. Overall, food and beverage production is expected to increase by 2.5 percent in 2008 and 3.2 percent in 2009. Refining. According to the EIA, U.S. refineries ran at 88.5 percent of capacity during 2007. Despite some evidence that high gasoline prices may be altering consumer behavior, demand for motor gasoline is expected to grow by 0.5 percent in 2008 and 0.3 percent in 2009, according to the EIA. The refinery capacity, however, is expected to contract by 11,000 barrels per day during 2008. As a result, the EIA projects that capacity utilization rates will tighten to 89.1 percent in 2008 and 89.3 percent in 2009. Pulp and paper. The $170.4-billion U.S. pulp and paper industry continues to be plagued by overcapacity, loss of customer markets overseas, penetration of Internet-based media, and evolution of electronic recordkeeping. As the U.S. economy falters, business spending on advertising in traditional print media will subside, and demand for paper in packaging will ease as businesses and consumers hold back spending. As a result, pulp and paper production will fall by 1.5 percent in 2008. As the economy recovers in 2009, pulp and paper production will be flat. Gas processing. Following the rebuilding of capacity after the devastation caused by Hurricanes Katrina and Rita in 2005, new gas-processing demand came online during 2007 with the launch of production from the Independence Hub in the Gulf of Mexico. New deepwater production is rich in natural gas liquids (NGLs) that must be stripped out prior to pipeline distribution. The EIA projects that marketed production of natural gas will increase 2.2 percent in 2008 and 0.8 percent in 2009. Shipbuilding. By some estimates, 70 percent of the world’s commercial shipbuilding and repair business occurs in Korea and Japan, with increasing activity in China. In the United States, the shipbuilding industry is a $15.1-billion industry. The shipbuilding industry depends on the volume of world trade, which continues to accelerate. China’s industrial sector, growing by double digits in each of the past five years, has become the world’s factory floor, sending record volumes of exports around the globe. On the other side is China’s demand for imported raw materials and energy, which must make the journey from all parts of the globe to be processed. The Baltic Dry Index, a price measure for marine transport of bulk commodities, reached record highs at the beginning of the year, signaling strong demand for marine bulk transport. However, an increase in new shipbuilding orders has not materialized in the United States. New orders have softened through the first quarter, suggesting weaker growth through 2008. Although there is considerable debate among economists about whether a recession has begun or will begin shortly, there is nearly unanimous agreement that the economy is experiencing its weakest performance since 2001. With increasing anxiety among consumers resulting from higher prices for everything except their largest asset and a manufacturing sector clearly in distress, the outlook is shaky. Historically, the U.S. economy has proved to be resilient time and again. With exports remaining strong, the potential for the economy to remain on a growth track without pushing inflation higher is certainly a possibility. At the same time, however, the risk of recession—and worse, stagflation—are very high.